I am ready for Spring to arrive and stay! I don’t like to rush the seasons but the taste of Spring weather we recently received was a welcome treat! I think most of my family and friends are ready. Ready to open up our windows, ready to see the flowers peek through, ready to get outside and enjoy the sunshine, ready to get out the lighter seasonal clothing and ready to decorate our homes with brightness!! I enjoy putting a new seasonal wreath on my door. I am always trying to find the perfect wreath! I have a black door and a storm door. I need a wreath that isn’t too wide and one that does NOT have hot glue on it! Too much heat! I learned this the hard way when one of my purchased wreaths came apart due to the glue melting! 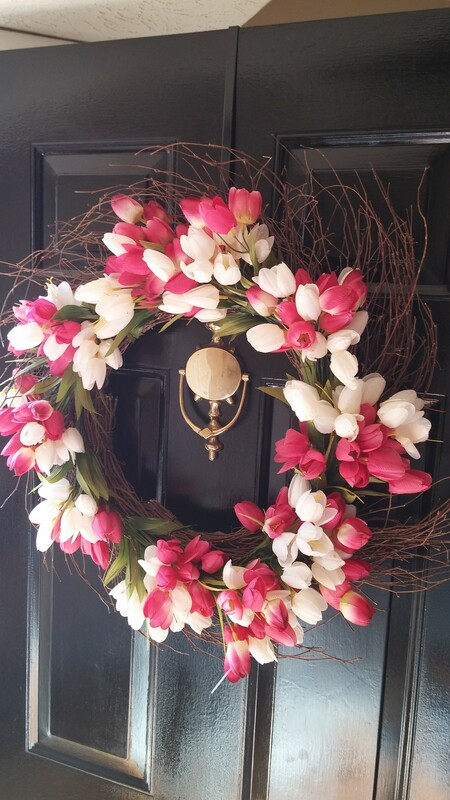 I was ready for a Spring wreath so I started searching online. I found a pretty tulip wreath at Pier One. 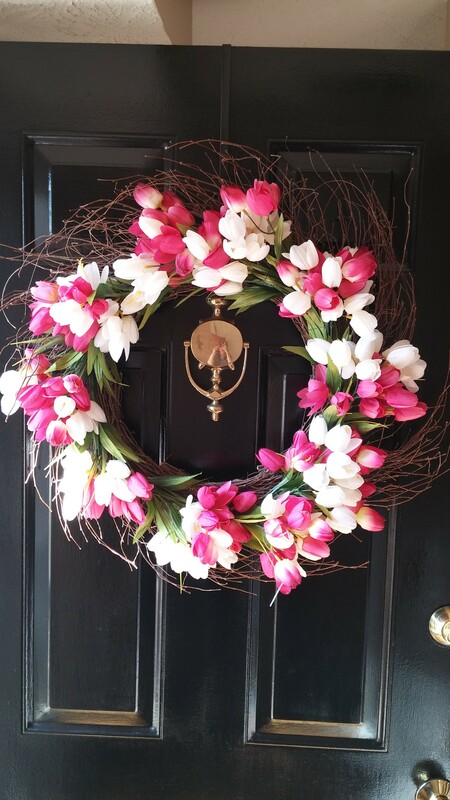 I believe all the spring wreaths are on sale for the month of March. I went to purchase this pretty inexpensive wreath and of course, Hot Glue!! So I went to Michael’s craft store, purchased similar materials and made my own! It was super simple! 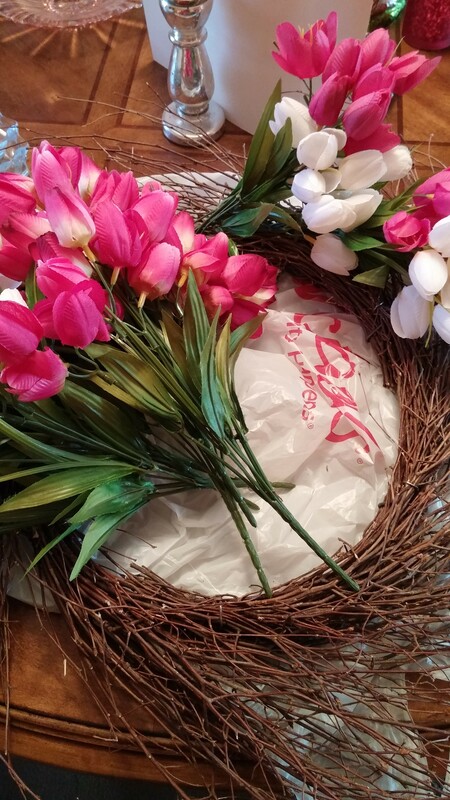 I purchased a 24 inch twig wreath, 10 bunches of silk tulips (5 bright pink and 5 white) that was it. I made sure I went to Michael’s when the flowers were 40% off and I used a coupon for the wreath. I used the wire I have at home. To give the wreath some color interest, I separated each bunch of flowers into 2 then I wired a white bunch with a pink bunch to make one. I then wired each bunch to the twig wreath. It is so simple to do and you can use any color scheme you like and any type of flower you like! 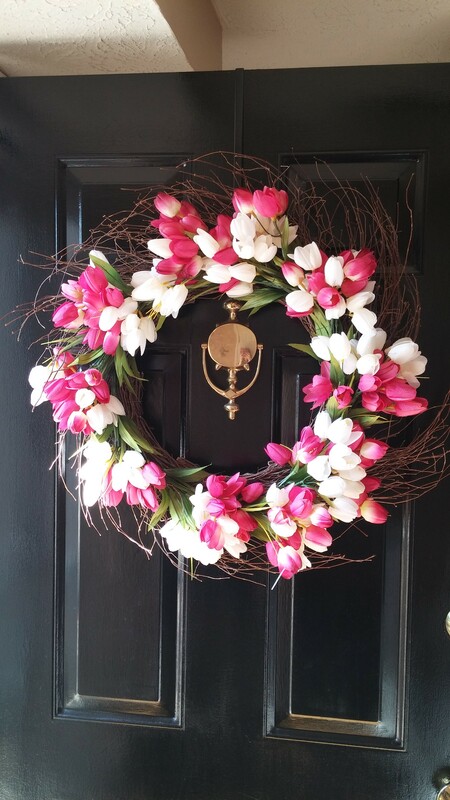 I hope you will give it a try and get ready for Spring by brightening your front door! ENJOY!